The race to showcase the fanciest concept interior at the 2019 Geneva Motor Show is heating up, and Kia might be sitting in pole position already. The automaker’s first pure electric four-door passenger car — the name hasn’t been announced yet — is headed to the year’s biggest auto show with 21 screens in tow. That’s not a typo, nor is it a joke. The concept really has 21 screens in the interior. 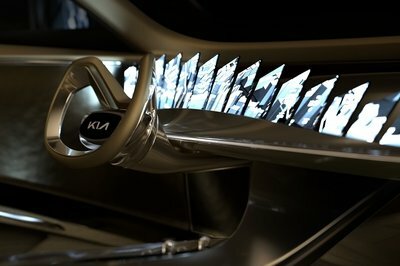 Fortunately, the concept isn’t all about these screens; the exterior also features a unique lights signature, specifically in the front end of the concept. More details are expected to be revealed once the 2019 Geneva Motor Show kicks off on March 7, 2019.